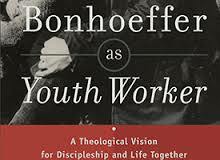 Written by Jason Okrzynski, Ph.D.
Bonhoeffer as Youth Worker: A Theological Vision for Discipleship and Life Together. Andrew Root. Grand Rapids: Baker Academic. 2014. ISBN 978-0-8010-4905-7 (pbk.) ix + 211 pages. $14.99. The emerging field of youth ministry has made a turn in recent years that seeks to incorporate intentional theological thought with the construction of theory for the art of ministry with young people. At the heart of this move has been the work of Andrew Root. Since his first illuminating publication, Revisiting Relational Youth Ministry: From a Strategy of Influence to a Theology of Incarnation, Root leveraged his own scholarly connection with the work of Dietrich Bonhoeffer in constructive dialectics with the history and theory of youth ministry. The result was a stunningly clear theological assessment of the assumptions implicit in much youth ministry. The power of Root’s critique, however, arose from Root’s adept deployment of Bonhoeffer’s Christ-o-form theological anthropology. The method and content were excellent and the result was the most important work on the art of youth ministry in the last ten years. Root’s most recent publication turns its constructive gaze more clearly and intentionally on Dietrich Bonhoeffer’s life and ministry itself. The draw, however, is not yet another Bonhoeffer biography, but rather the continuing work of a practical theologian. Root seeks to offer a fresh perspective of Bonhoeffer, distinct from Stephen Haynes’s revolutionary, conservative and liberal approaches. Root seeks rather to examine Bonhoeffer as minister to children and youth. Drawing richly on a wealth of biographical and primary Bonhoeffer source materials, Root paints a compelling picture of Bonhoeffer not only as one whose ministry took part in the formation of young persons, but whose life, work and witness were richly formed by his experience through these relationships. Root’s examination follows a fairly typical approach. He begins by examining the Bonhoeffer family and Dietrich’s role within it. Root does not simply rehearse the oft told stories, but rather with skillful storytelling and scholarly precision, he immediately begins drawing formative connections between Bonhoeffer’s familial influence and his professional development. The biographical arch presented continues to follow key developments in his life, including his relationships with Adolf von Harnack and Karl Barth, his experiences in New York City, and of course the war, Finkenwalde and ultimately the conspiracy. In the midst of this, however, Root casts a fresh light on the consistent and important role that ministry to children and youth made, making a compelling case that Bonhoeffer’s courageous witness came from his care and love of these, the littlest ones. Root draws enlightening connections between Bonhoeffer’s scholarly work, historical pastoral ministry and the ultimate emergence of ethics and martyrdom, so respected by history. Perhaps the most surprising gift the work imparts is Root’s ability to draw out contemporary theory from his close observation of Bonhoeffer’s biography. In one compelling exchange Bonhoeffer offers impromptu pastoral care to a young boy who stopped by to complete a church-relate errand. The young boy, deeply distraught by the loss of his family dog, spontaneously confesses his suffering to Bonhoeffer, breaking down in tears on the young pastor’s doorstep. Root not only relates the story, which Bonhoeffer shares verbatim-style in a personal correspondence, but also interprets the incident from a practical, theological standpoint. Root observes that Bonhoeffer not only consoles the boy but engages in cooperative theological construction and imagination with the young man. This incident represents the real gift of Root’s biographical account, namely his ability not only to offer a retelling of Bonhoeffer’s life but to mine these stories to offer contemporary readers and practitioners relevant and grounded new theory on the art of ministry from Bonhoeffer’s own practice. The book closes with a second section that seeks similarly to mine Bonhoeffer’s works Discipleship and Life Together. The rationale for this is Root’s own encounter with these works particularly popular among youth, youth workers and camp counselors. This section continues to offer important new insights and theory on the practice of youth ministry. The scholarship remains excellent, still rich with wisdom and compelling new theory. From a reader’s experience, however, this aspect of the work does lose some of the compelling energy and focus of the first section. If one is looking for a weakness, this section is likely it. Root’s new work is a compelling and relevant contribution to a crowded conversation, which does not mean that it should not have its readers. Root’s work offers new theory in the field of Christian education, practical theological method and thought and Bonhoeffer scholarship; as such I would recommend this work to all interested in these fields. However, as Root asserts, the field of children, youth and family ministry is already crowded with those taken by an interest in Dietrich Bonhoeffer. Bonhoeffer as Youth Worker offers such readers a particularly promising read and an indispensable addition to the professional library.